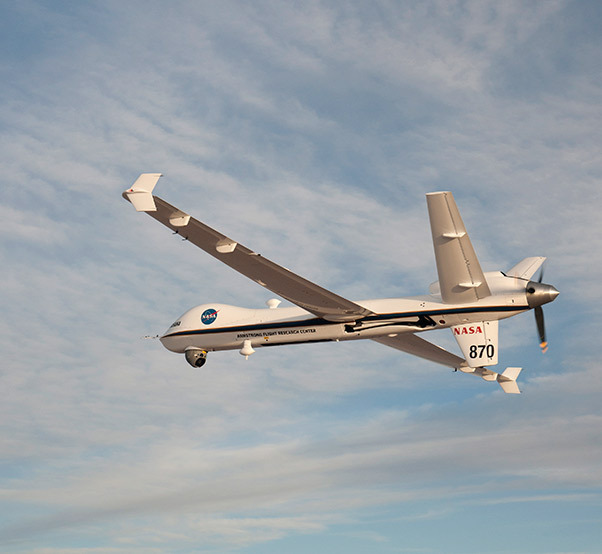 The Ikhana remotely piloted aircraft captured real-time video when the Orion Exploration Flight Test-1 mission concluded on Dec. 5, 2014. It is planned for the Ikhana to capture video again for the Orion and Space Launch System Exploration Mission-1 (EM-1) certification flight. NASA’s Orion space program representatives came to NASA Armstrong Flight Research Center in California recently to honor employees’ contributions and talk about the space program. Charlie Lundquist, NASA Orion deputy program manager, C.J. Johnson, Orion project manager for the Capsule Parachute Assembly System, Ann Bufkin, Orion CPAS test engineer and Barbara Zelon, Orion program communications manager, also learned details of the center’s support during their visit. 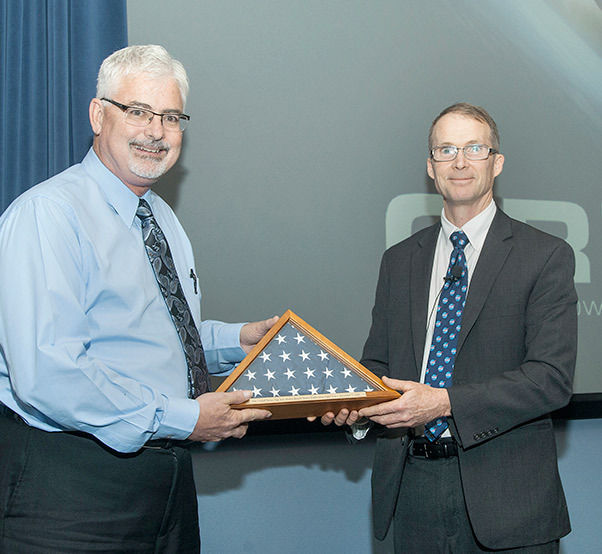 During the award ceremony, Lindquist presented Armstrong Deputy Director Patrick Stoliker an American flag that was flown aboard the Orion capsule during the Exploration Flight Test-1 (EFT-1) mission on Dec. 5, 2014. 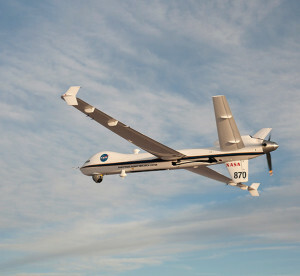 NASA’s Ikhana remotely piloted aircraft, which is based at Armstrong, was used to captured live video during the Orion re-entry and landing for that mission. Planning is ongoing for the Ikhana to again be available for the re-entry at the conclusion of the Orion and Space Launch System Exploration Mission-1 (EM-1) certification mission expected in 2018. Charlie Lundquist, NASA Orion deputy program manager, right, presents an American flag flown aboard the Orion capsule during the Exploration Flight Test-1 mission to Armstrong Deputy Director Patrick Stoliker. To support CPAS, Armstrong provides air-to-air aircraft imagery and chase plane support for the C-17 airlaunch of the system tested at the U.S. Army’s Yuma Proving Ground. Photography and videography is used for test reconstruction and parachute performance photogrammetric analysis. In addition to work on EFT-1, Armstrong is supporting CPAS during the qualification testing for EM-1. A successful flight is a step toward a manned mission in the early 2020s. EM-1 is a Proving Ground mission. The Proving Ground is the space near Earth and extending beyond the moon’s orbit where we demonstrate human and technical capabilities for long-duration space exploration with the goal of achieving Earth independence and readiness to proceed on the long voyage to Mars. “EM-1 will validate that the systems are safe and reliable because the next time it counts – when we have astronauts aboard,” Lindquist said. 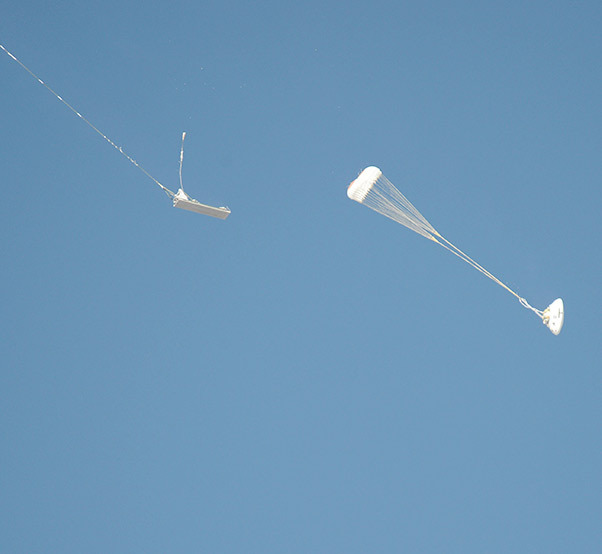 NASA Armstrong is supporting Orion launch abort system flight test development, including preparations for the Ascent Abort-2 (AA-2) abort flight test in 2019. Armstrong will be providing development flight instrumentation for AA-2. Armstrong also manages the NASA contract for the Abort Test Booster, which will be used for the AA-2 launch. An Orion parachute test enters a new phase following separation from a platform. The Orion spacecraft and the Space Launch System (SLS) exploration rocket will enable humans to travel into deep space on NASA’s journey to Mars. Teams across the country are making steady progress toward their first integrated flight, including building a revitalized launch complex at Kennedy Space Center in Florida. Armstrong, Edwards Air Force Base and many suppliers in California contribute to making Orion and SLS missions successful and enabling NASA’s journey to Mars. The Orion and SLS programs collectively have 762 supplier and subcontractor companies in California working on the Orion (300) and SLS (462) programs. Suppliers across California are designing and manufacturing complex and detailed lightweight metallic and composite structures, specialized components and tooling, and other elements critical for NASA’s next deep space human exploration missions.